The western Iraqi city of Ramadi on Sunday fell to the Islamic State of Iraq and Syria (ISIS), after the militants relentlessly bombarded the capital of the Anbar province with suicide bombers, Al Arabiya News Channel reported. 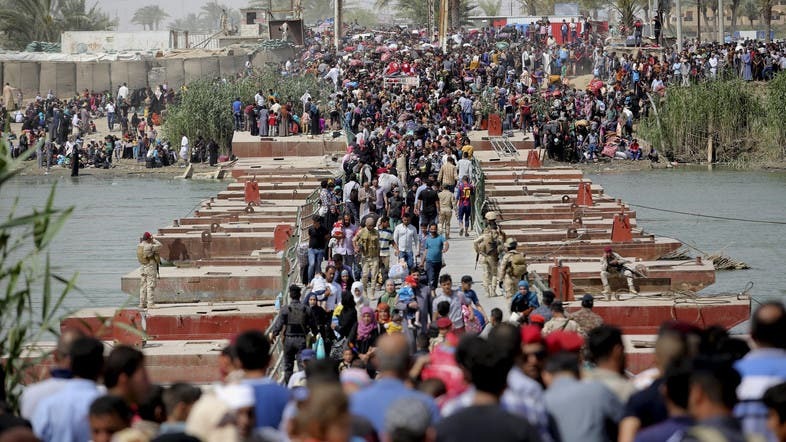 Ramadi fell after the Iraqi army deserted the city, the channel added, in a withdrawal echoing the military’s shock departure from Iraq’s second largest city of Mosul in June last year. ISIS also claimed to hold the entire city but Iraqi officials disagreed with each other over whether Ramadi had fallen. Iraqi Prime Minister Haider al-Abadi ordered government forces to “hold their positions” in Ramadi, after ISIS said it overran the strategic city, his spokesman said. Abadi said troops, tribesmen and other elite forces “must hold their positions and preserve them and not allow Daesh (ISIS) to extend to other areas in Ramadi,” spokesman Saad al-Hadithi said. “There is continuous air cover that will help ground troops there hold their positions while waiting for support from other forces and the Popular Mobilization Units,” he said of an umbrella group for Shiite militias. Anbar province is primarily Sunni and many worried sending Shiite militias into the region could spark greater outrage among those still there. Meanwhile, officials told Agence France-Press that ISIS militants on Sunday took over the provincial operations command center in Ramadi, putting the jihadists on the brink of capturing the Iraqi city, officials said. “Anbar operations command has been cleared,” Muhannad Haimour, spokesman and adviser to the province’s governor, told AFP. Several security officials confirmed the retreat. Security sources also told Reuters that ISIS militants overran one of the last remaining districts held by government forces in Ramadi on Sunday and besieged a key army base on the edge of the western provincial capital, security sources said. Anbar provincial council member Athal Fahdawi described the situation in Ramadi as “total collapse” and said local officials had voted in favor of the deployment of Shiite paramilitaries to the Sunni heartland. Shiite paramilitaries have played a leading role in reversing Islamic State gains elsewhere in Iraq, but have so far been kept on the sidelines in Anbar due to concerns about inflaming sectarian violence. The insurgents were closing in on the Anbar Operations Command to the west and a military officer inside the army base said it was too late to send reinforcements, pleading for help from Abadi. “We are now surrounded inside the Operations Command by Daesh, and mortars are raining down,” said the officer. Daesh is an Arabic acronym for Islamic State. “Daesh fighters are in almost every street. It’s a chaotic situation and things are sliding out of control. Ramadi is falling into the hands of Daesh,” the officer said. The news comes after a suicide car bomb attacks killed 15 members of Iraqi security forces Sunday in Ramadi. Police and army officials said four nearly simultaneous bombings targeted police officers defending the Malaab district, killing 10 and wounding 15. Among the dead was Col. Muthana al-Jabri, the chief of the Malaab police station, they said. Fierce clashes erupted between security forces and ISIS militants following the attacks. Subsequently, ISIS militants seized the Malaab area after government forces withdrew. A police officer who was in Malaab said retreating forces left behind about 30 army vehicles and weapons that included artillery and assault rifles. He said some two dozen policemen also went missing during the fighting. The officials spoke on condition of anonymity as they weren’t authorized to talk to journalists. Meanwhile, Iraqi warplanes launched airstrikes on ISIS positions inside Ramadi on Sunday, the Iraqi Defense Ministry said, without elaborating. Last week, the militants swept through Ramadi, seizing the main government headquarters and other key parts of the city. It marked a major setback for the Iraqi government’s efforts to drive the militants out of areas they seized last year. An estimated 500 people, civilians and security forces, were killed in the jihadist offensive on Ramadi, a spokesman for the governor of the Iraqi province of Anbar said. “We don’t have an accurate count of casualties yet but we believe at least 500 people, both civilian and military, have been killed over the past two days,” Muhannad Haimour told AFP.